It’s a blustery Autumn day outside today. The perfect day to sit at home with cups of steaming tea and no makeup! Just a day for clean skin and a hearty moisturizing routine! A few months ago I picked up a $15 package of travel sized sample of The Body Shop‘s Seaweed face cleansing line for combination/oily skin. After having already tried and loved the Seaweed Ionic Clay Mask, I was really looking forward to trying the complete line. – Seaweed Deep Cleaning Facial Wash: this refreshing gel is meant to remove impurities, make-up, and excess oil from your face. Although I usually prefer foaming cleansers, this gentle cleanser leaves me skin feeling quite clean and refreshed. I do believe that I will be repurchasing this face cleanser when my small sample is all used up. – Seaweed Clarifying Night Treatment: This moisturizing lotion is meant to balance remaining oils on your face as well as deeply moisturize. Along with the Clinique Clarifying Lotion, I am also quite attached to the Dramatically Different Moisturizing Gel from Clinique. Once again the Seaweed Night Treatment has not swayed my love of Clinique. I find that the formula used to ‘balance’ my face’s oils actually brings them out more. My t-zone becomes more oily and I awake with a greasy face. I will not be repurchasing the Seaweed Clarifying Night Treatment. – Seaweed Mattifying Day Cream: Of all 4 products within the sample package, this Day Cream is my favourite. I am all about the matte affect. I have combination/oily skin, and on those days when my face is shiny, or that I wake up feeling a little greasy, this mattifying cream is amazing. It feels great on my face, is highly moisturizing, and keeps my face matte under my makeup. I’ve started using this cream every day! I apply it after a shower and before my makeup. This will most definitely be repurchased. 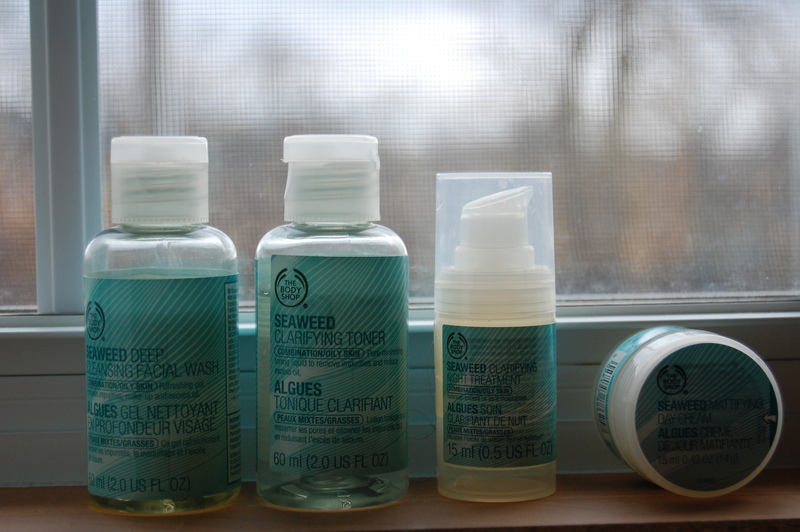 So in all, I’ve grown to love 3 products of the Body Shop’s seaweed line! 3/5 isn’t bad. (Ionic Clay Mask, Deep Cleansing Facial Wash, and Mattifying Day Cream) There are a few more in the line (I think) that I’ll have to try to make a final decision about the line as a whole. But for now, as the rain is starting to fall outside, it’s time to wash my face, tone, moisturize, and curl up with my cup of tea and my kobo (ereader). So get out there! The Body Shop sell’s small sample packages of many of their facial lines. (Tea Tree, Chamomille, Vitamin E, etc). I can’t wait to try others!